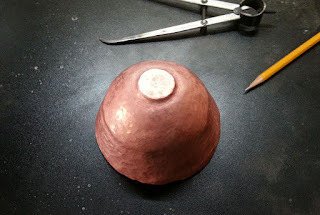 My thoughts and efforts on the way to becoming a metals artist. This is the post that I should have made yesterday and was too wiped to get it done. Read on and you'll see why. I'm picking up another gauntlet. Wendy Edsall-Kerwin has offered a challenge for several years - make a bowl (or complete it) on Super Bowl Sunday. I wanted to do this last year but we were in the middle of moving house. But this year I can say "challenge accepted!" 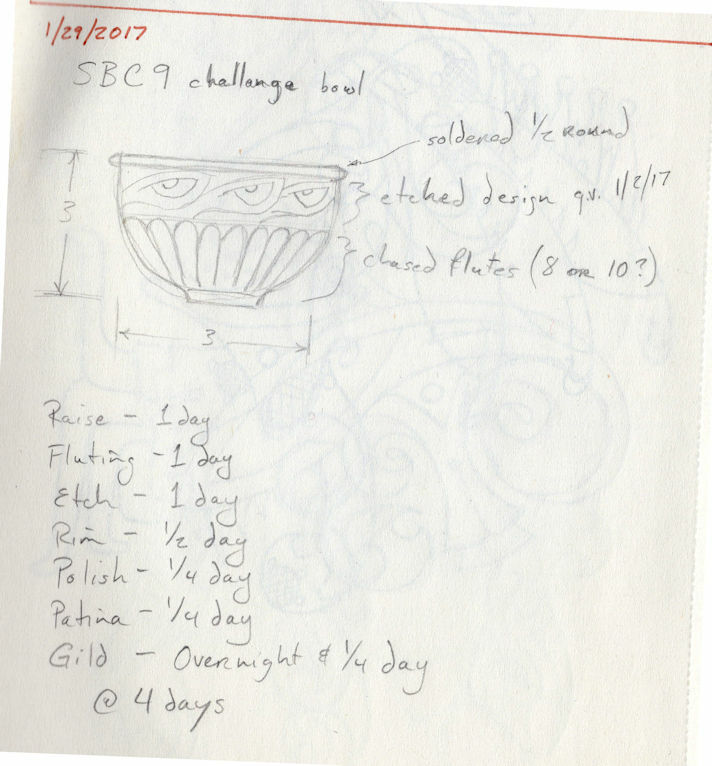 On Sunday I sketched out an idea for a bowl and tried to figure out how long it would take to complete. My guess was one day to raise it from sheet, another day to chase in the flutes. 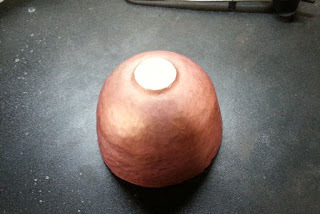 A day to etch a design into the vertical part of the bowl. 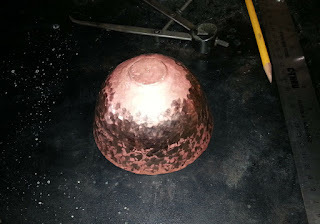 Another day to solder on a rim, polish, and apply a patina. 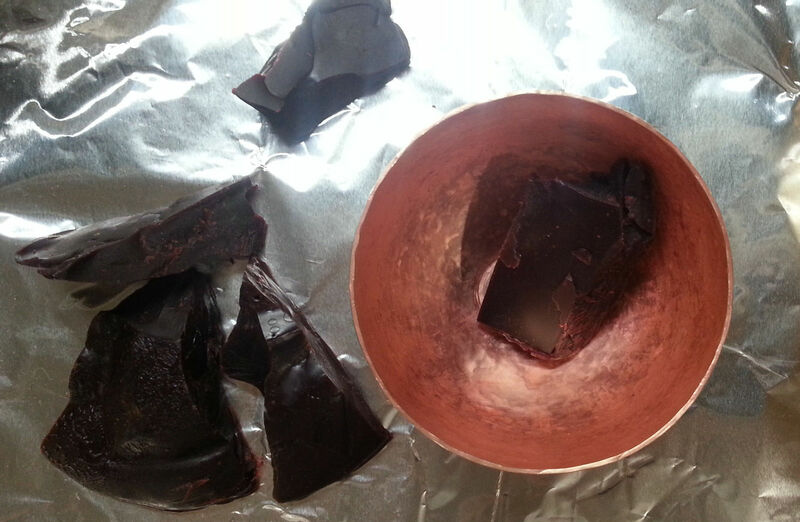 Apply the gold size to the interior the same day and then a few hours the next morning to apply gold leaf. All told, a little more than 4 days. That gives me some wiggle room since Officer Murphy is always on duty and he is The Law. The original sketch. Measurements are wrong. There was one potential pitfall. I didn't have any half-round copper wire in a large gauge (6 or 10) so I'd have to order some or figure out something else to do. As it turned out, I ended up ordering some. 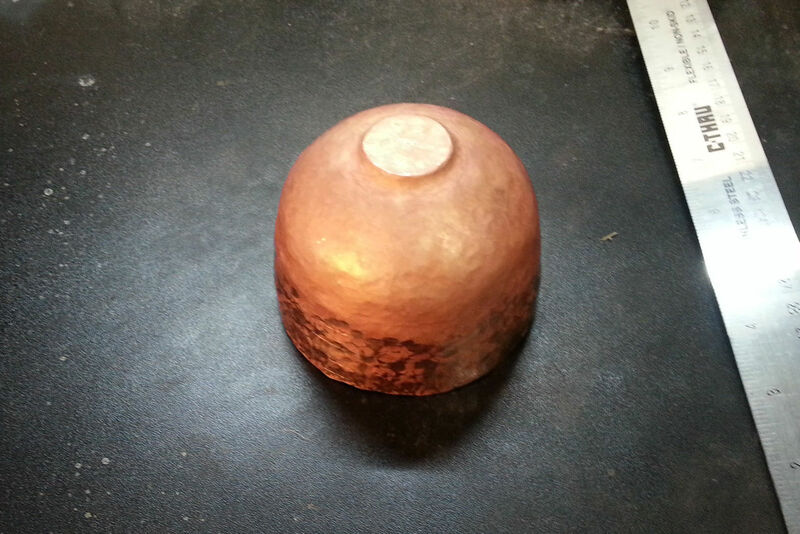 I got started about 11:30 am by annealing a 6 inch diameter disk of 16 gauge copper that I already had on hand. That was the first goof. I normally use 18 gauge, a little lighter. 16 gauge is just enough heavier that I had to work harder than I wanted to get the metal to move. 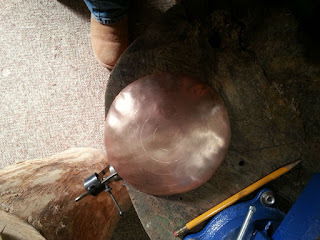 The first step is to lay out concentric circles as guides for hammering. The circles go on what will be the outside of the vessel. 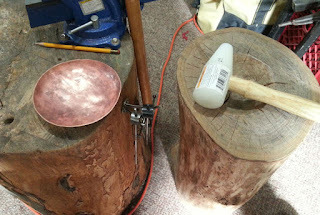 But the first pass for forming is to dish the bowl a little, working with a plastic auto body mallet and a hollow cut into a tree stump. 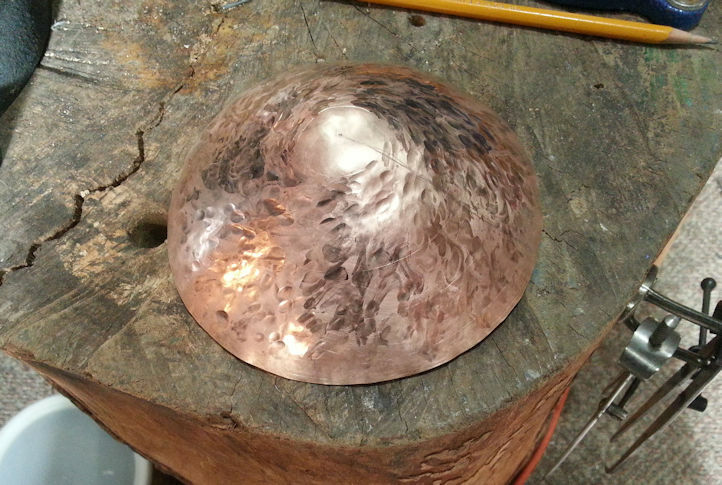 Dishing works from the inside of the piece. After that I started raising. I didn't bother to anneal between dishing and the first round of raising. I hadn't moved the metal that much, the guidelines were still clear, and I thought I could get away with it. 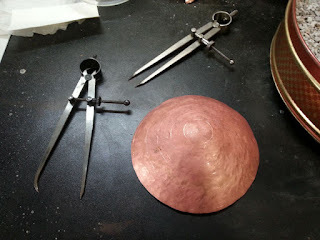 It went well and I bouged the shape into some semblance of regularity with a leather mallet and a large (5" ball) steel sphere stake, then took it to the hot bench to anneal and pickle it. 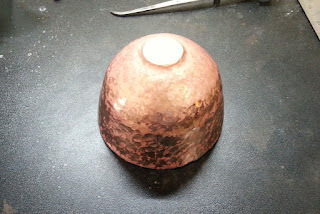 From then on it was round after round of raising, bouging, annealing and pickling. I tried to take photos at each round but apparently missed some. After round 2 I spent some time setting the foot and beginning to define it. I refined it a little over the next several rounds and was then able to leave it alone. 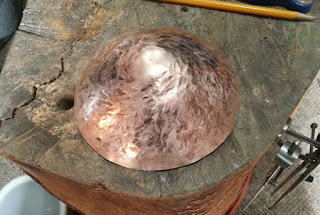 As the bowl rose, I took note of where the profile was supposed to transition from hemisphere to vertical. 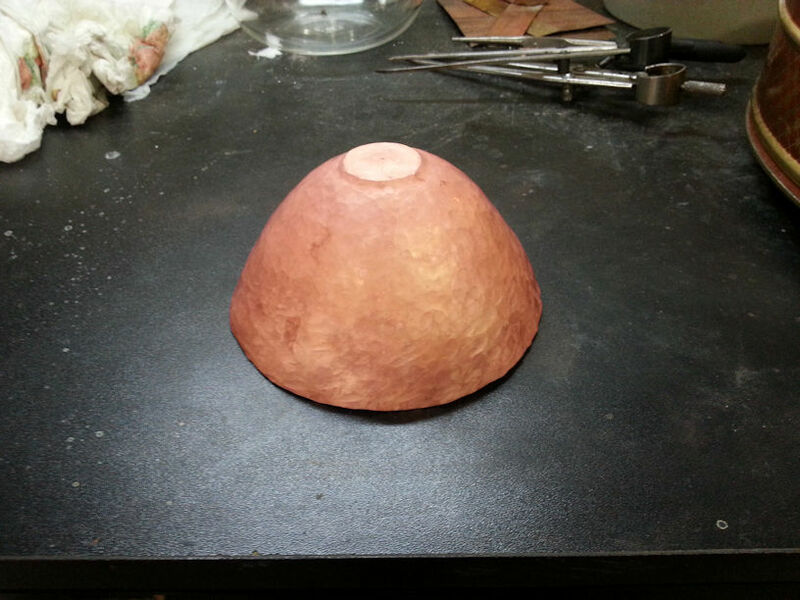 When I got close to that point I started to planish the hemisphere part so that I could get it nice and round and smooth. I used a smaller (3" ball) steel sphere stake for that. 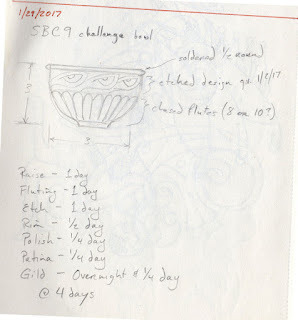 By 7 o'clock I had raised the bowl through nine rounds and was exhausted and hungry. It was obvious that I was not going to get the raising done in one day. Rather than push myself when I was too tired and risk making a mistake, I called it a day. Today was supposed to be putting in flutes but the bowl was no where near ready. I got to work about 10 am and went through 7 more rounds of raising to pull the walls up to vertical. 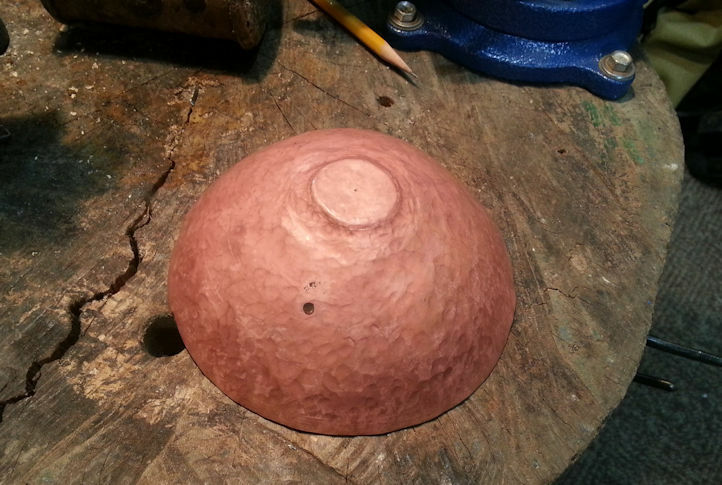 Luckily I had essentially finished the hemisphere portion of the bowl yesterday so I didn't have to go over that area any more. That makes the rounds go faster. But it's still slow going to get that much metal to come in and form a smooth vertical surface. I should note that this is the first time that I've tried to do this kind of shape. I'm used to conical or egg shapes and a cylinder was new to me. But it went pretty well and finally got to a point where I could start the next phase. Raising makes an uneven edge at the top and I wanted to cut that off so that the shape was ready to planish. 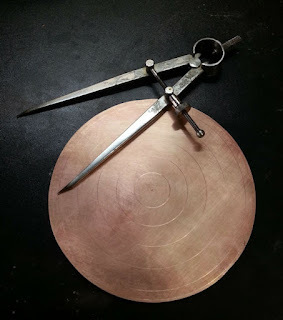 I used a surface gauge instead of the dividers I had been using to scribe guide lines. That's so I was sure to have the edge parallel to the foot. I cut off the excess with shears and then evened and flattened the rim with a file and a belt sander. 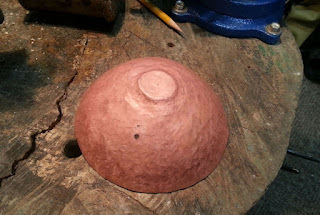 A little sandpaper to smooth the rim and the basic shape was done. 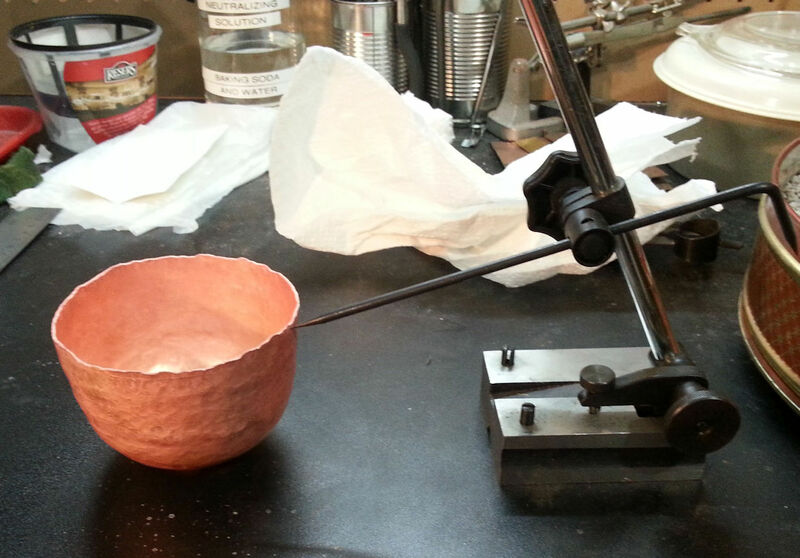 Using a surface gauge to mark the trim line. 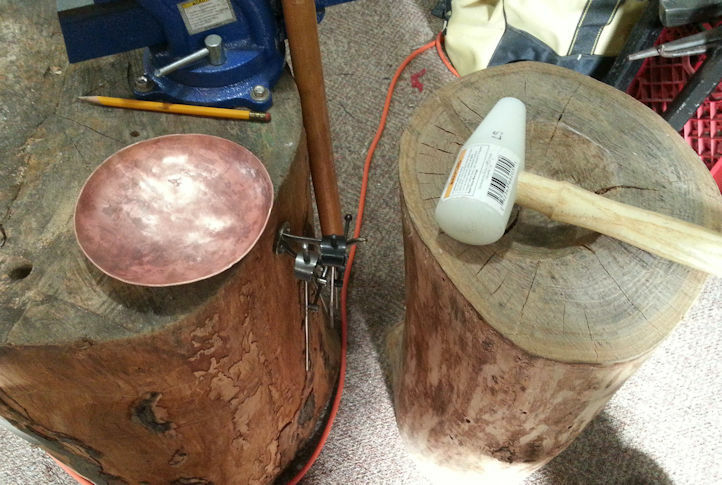 Then it was on to planishing the cylinder portion of the bowl. 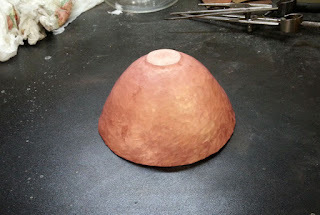 The hemishpere was pretty well done yesterday but there were a lot of raising marks that needed to be smoothed out. In the process I also made sure that the cylinder didn't have any dips or bulges or waves left over from when the shape was being formed. Normally this would be done on a cylinder stake of a size that matched the curve. But I don't have one and didn't have time to make one. So I improvised with the 3" sphere stake, my large raising stake, and a process where I gridded off the cylinder into 8 columns and three rows and worked them over in sequence by columns from bottom to top. As each area got planished it also got blended with the areas below and behind it. By the end of the process, I had a smooth cylinder. Then the foot got a little attention and the whole thing was planished and ready to prepare for chasing. I want to be able to start up tomorrow ready to lay out the flutes and get right to chasing. To do that, I have to fill the bowl with chaser's pitch or something like it. I've been using red sculptor's was for this instead of actual chaser's pitch. I'm following David Huang's recommendation in this and have found that it works quite well and causes fewer problems for me than the pitch. 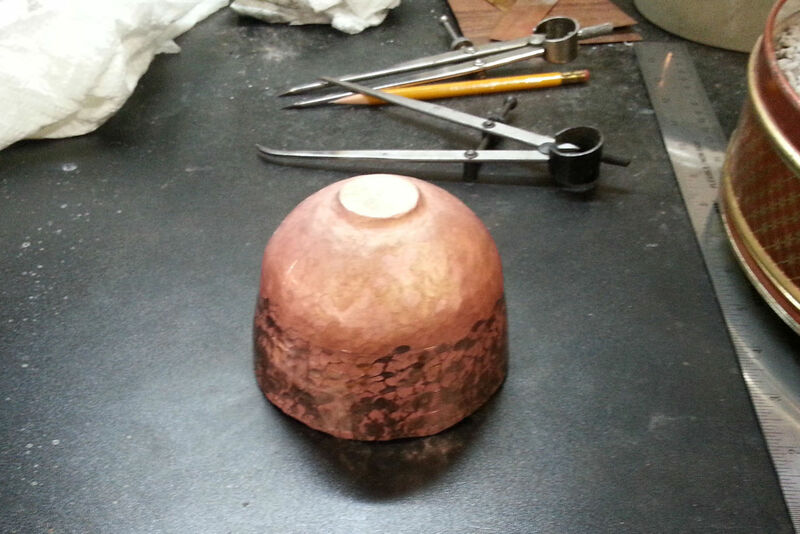 Before filling the bowl, I annealed it one more time so that it would be soft and workable for the chasing punches. That's when I got a surprise. 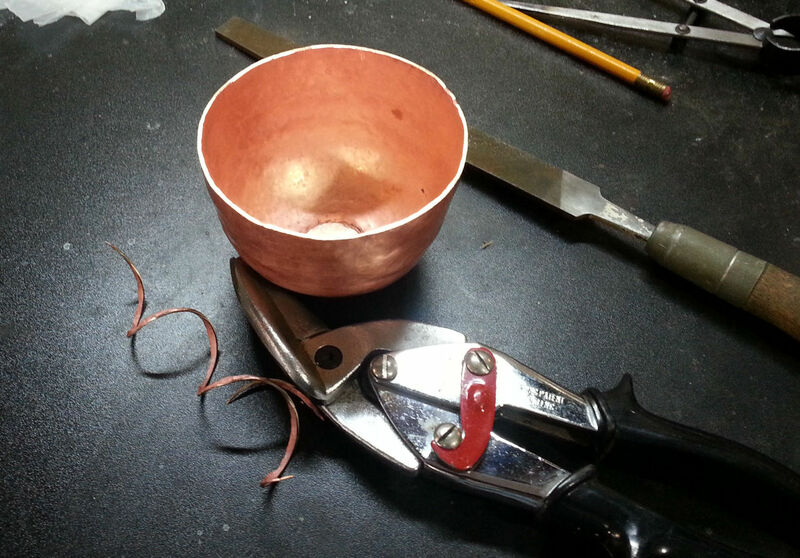 I'd been annealing this bowl frequently for two days. 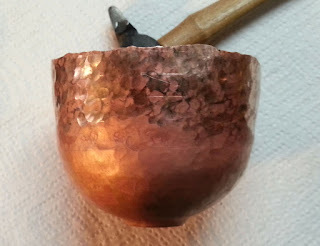 Somehow it had escaped me that when it was quenched after annealing and before pickling it didn't look the way copper usually does. 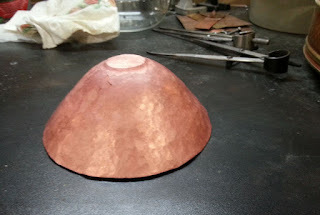 After pickling it looked like normal copper, a lovely pale pink. But before that it looked oddly bronze-ish and mottled. Well, after this pickling I wanted to scrub it up nice and clean so layout lines would show up well. That's when I noticed that the scrubbed parts looked golden yellow, not coppery. What the...? A quick check with a file on a piece of the sheared off edge confirmed it. I've been working 16 gauge brass for two days. No wonder I was getting tired! With that out of the way I filled the bowl with wax and left it to cool while I had dinner. Tomorrow I'll do the layout of the flutes and see if I can get them chased in before the day is done. It's been a long fun day. See you tomorrow. This week's finished project is an extension to last week's. A focal needs something to hang from so this week I made a chain for 'Don't Leave Home Without It'. 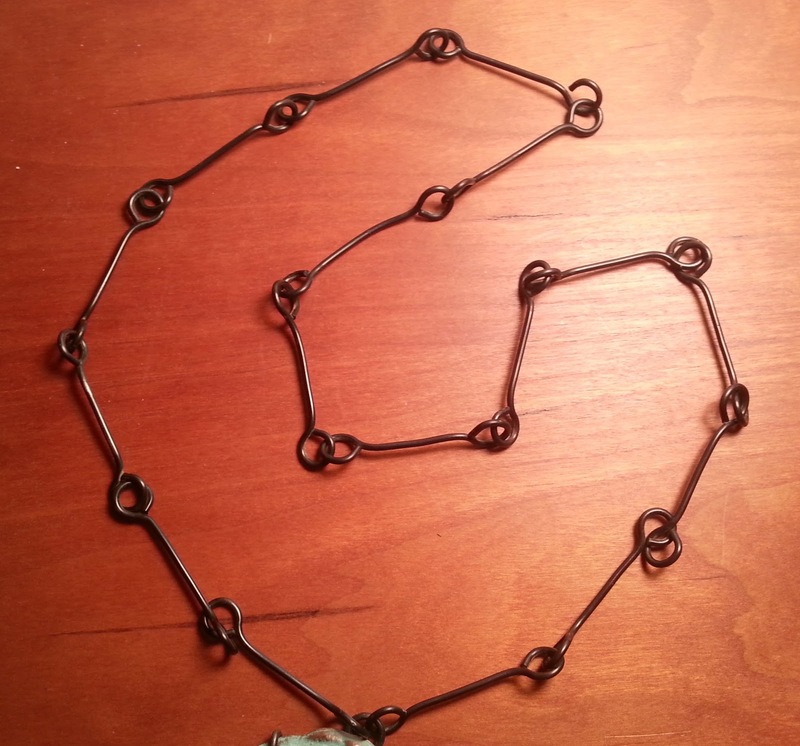 The setting for DLHWI is made of iron binding wire, so I thought I'd continue using that for the chain. It was a challenge because I'd never made any chain before. I started by making a single link and then trying to duplicate it. No luck. Could not get the links to match. Then I tried to make a batch of links starting with cutting a set of identical length blanks. That worked, but didn't match the original link that I had made and liked. So I measured out a piece of wire that I knew was too long, Starting at one end, I went through the steps to form the link carefully matching the length of the link I wanted. When it was done, I cut off the finished link and checked to make sure it duplicated the original. It did. I measured the remaining wire, subtracted that from the original wire length and that was the length I needed to make the links I wanted. Turns out I needed 2 and 7/8ths inches for a link. Cut off a length of wire about a yard long, enough for a batch of links. Secure one end in the vise and use a green scrubby to scour off the black oxide coating of the iron binding wire. This also helps straighten the wire. Mark off the link length on a piece of wood and use that to mark and cut link blanks; as many as can be gotten from the length of wire. A set of diagonal cutters was used to cut the blanks. Grab six or so blanks and align them so all the ends on one side are even. Use a disc sander to sand them all flat. Flip the stack over and sand the other side so they are all flat and even. Now all the blanks are the same length and have trimmed ends. Do this until all the blanks in the batch are done. 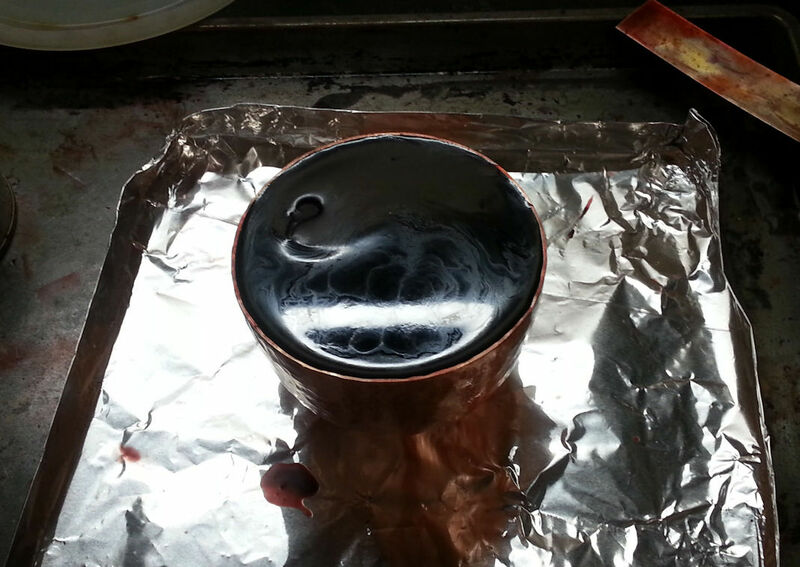 Note, you will want to quench the first end in a dish of water before flipping it around and grabbing the freshly sanded (hot) end. Ask me how I learned this. Using a pair of bail-making pliers (or a marked pair of round-nosed pliers) turn the eye on one end of each blank. Make sure that you get the cut end of the wire to touch the shaft of the link and that you reverse curve at the base of the eye so it's centered on the shaft. Use a mallet and bench block to flatten the eyes and make sure that they are on the same plane as the link shaft. Take the opportunity to straighten any kinks or curves in the shaft at well. Turn the eyes at the other end of the link. 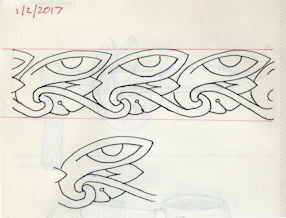 If you want them to be like the one's I did, make sure that the second eye is at right angles to the first eye. Look them all over and make any tweeks needed to get them just right. That's one batch of links. Lay them out and see if you've got enough. If not, go back to step one and make another batch. I ended up making three batches and have several left over. 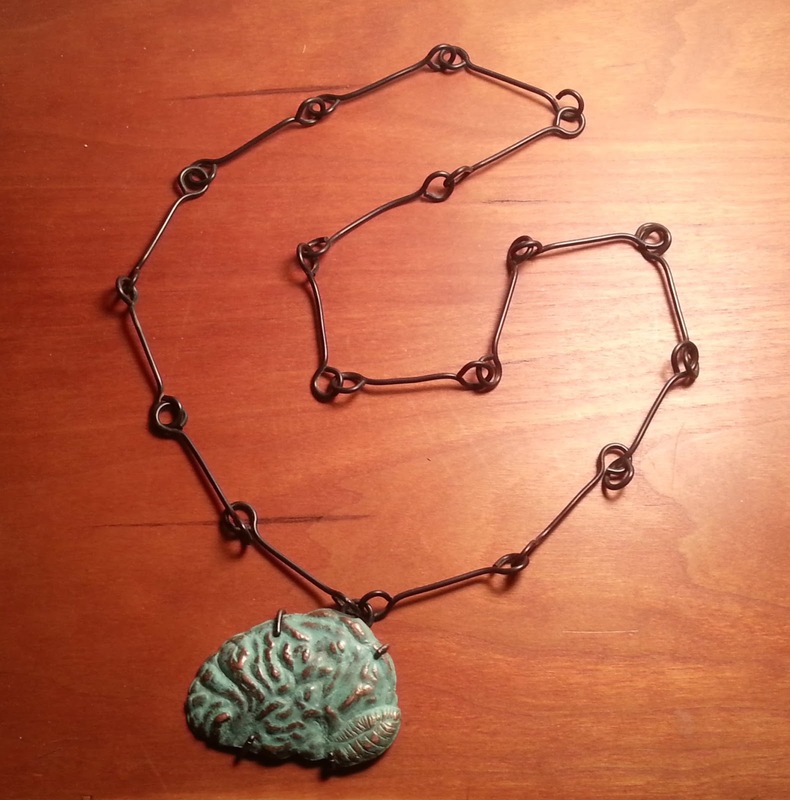 Once I had enough links I used Birchwood Casey Cold Gun Bluing solution to patina each link a nice dark black. I dried them and applied Renaissance Wax to coat and seal them. After they were dried and buffed the links were ready to connect to each other and to the loop of the pendant. I wrapped my pliers jaws with tape to protect the links from scratches while I opened and closed the eyes to join them. I'm pretty pleased with my first chain. Here's the whole thing. 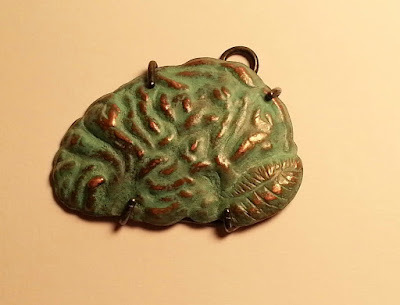 Remember, it's your brain. Don't Leave Home Without It. 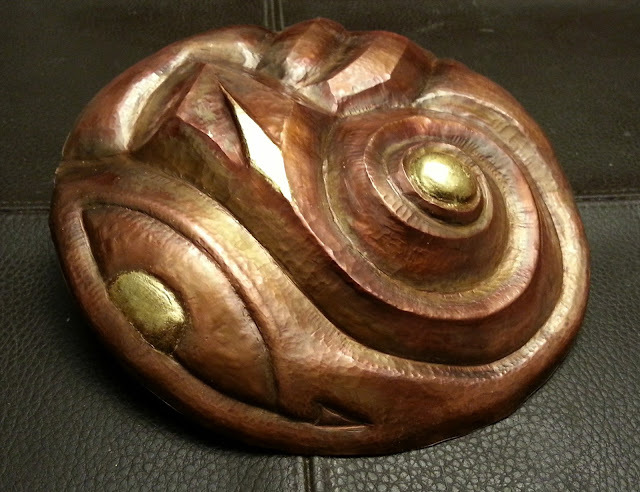 This week I have two finished items to show. More than that got done, but these are the ones I took photos of. First is the piece I had hoped to finish last week, then gacked when I was closing the last prong. It's fixed, has a new patina, and a new prong mount. May I present Don't Leave Home Without It. Copper, chased and repousséd, cupric nitrate patina, sealed with Renaissance wax. 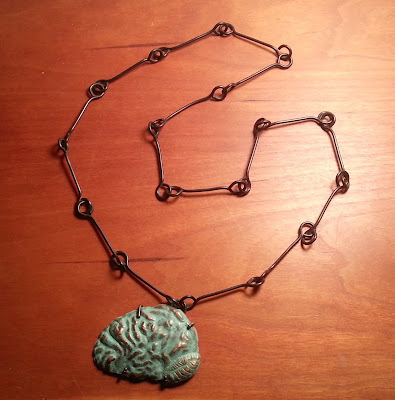 This is your brain on jewelry. Back side showing the steel setting. The setting is steel wire soldered together. I owe a debt of thanks to Peg Fetter, who was kind enough to field my phone call full of questions out of the blue and who pointed me in the direction of a book which had clear instructions and photos on how to solder steel. That's The Penland Book of Jewelry: Master Classes in Jewelry Techniques. The chapter by Rob Jackson covers fabricating jewelry with steel. Thanks Peg! When the focal was done I decided to try fabricating a chain for it. That's currently in pieces on the bench. It's been a rough week here. We narrowly missed the brunt of an ice storm. Various other things went on that disrupted the daily routine so less got done than I would have hoped. I had hoped to show you a completed pendant - a chased copper brain I was going to call "Don't Leave Home Without It". It was almost done last week. Then on Monday I was closing over the last prong on the setting and the prong pusher slipped. 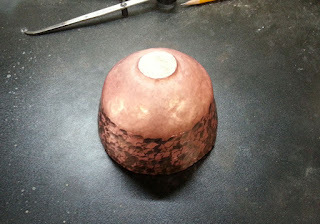 It put a dent and a gouge in the chased copper and knocked off a bunch of the patina. I had to cut off the setting and take the whole thing back to bare metal before I could repair the damage. I need to go through a number of finishing steps and remake the setting before i can get it back to the point it was. Perhaps this time I can close all four prongs without mishap. Anyway, I decided to take a break and do some work on getting the mess in the studio cleaned up. When we moved in all sorts of stuff got stuck in the basement. Some of it should have been there but some really belonged elsewhere. It was a mess. Just a jumble and no floor space to move in. 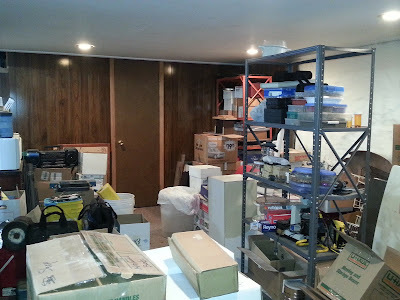 There were a bunch of woodworking and blacksmithing tools that ought to have gone into the shop space in the garage. So I wrestled them out of their various hiding places and set them aside to get moved into their proper location. I was also able to go through several boxes of mixed items and sort them into bottles and boxes, labeling them as I went. I was able to move a shelving unit which held a lot of miscellaneous stuff and get it better arranged. Various other items got moved out or rearranged and now the west side of the studio is looking a lot better. It's not finished by any means, but I now have this side of the studio in better shape and I know what is actually in the boxes. Almost all of them are now labeled. 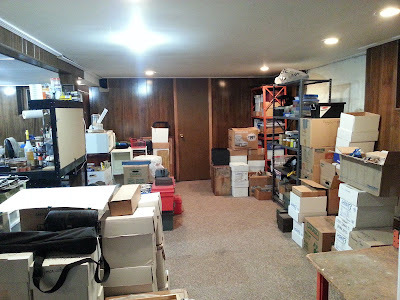 I had hoped to move all the stuff that had to go to the garage but only got it to a staging area upstairs. The ice interfered but another complication came up that made things worse. There were two bulbs out in the side area of the garage which left it pretty much in darkness. I figured I'd replace the bulbs, rearrange a few things to make room, and then move the woodworking and smithing tools into their proper places. Easy, right? Not exactly. When I got up on a ladder to change the first bulb it briefly lit, then popped and sparked. Then the socket came off in my hand. It had been installed badly and was waiting to fail. Okay - try the second bulb. Same thing. So now I have to replace two sockets in order to have light so I can put things away. I can see that the coming week is going to be more interesting than I had wanted. But I've got floor space in the studio! Several days were unproductive this week because I was laid low by some passing micro-organism. While I began to feel better by Thursday, there wasn't time to complete very much. Still, I was able to move things around in the studio and get a little more organized and I was able to put the patina, sealer, and gold leaf on an Elsewhen Antiquities piece that I showed back on November 5th. 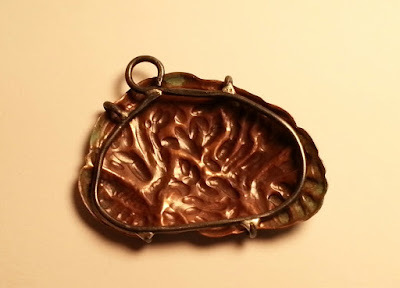 The patina is Liver of Sulfur. 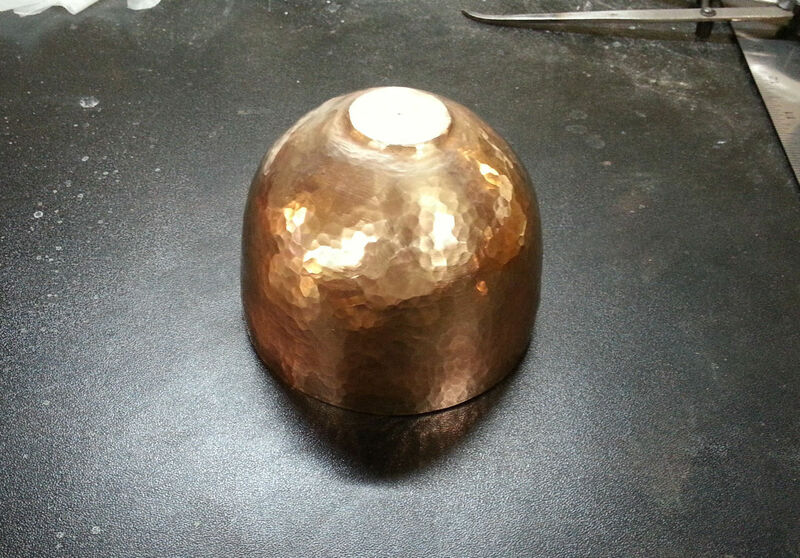 It's sealed with Renaissance Wax and the three spots with gold are 23 kt leaf. The patina actually has more reds and iridescence in it, but my photo skills are't up to showing it. I'm still working out how to mount this on a wooden plaque for display so I suppose there's a question as to whether this counts as a finished piece. What do you think? Finished enough to count? Well it's been a year. What a year. My personal fortunes have risen while the nation's fortunes have been battered and beaten. A year of many deaths great and small. A year of precious archeological treasures destroyed by a band of heartless, zealous thugs. A year of tumultuous politics culminating in the election of the worst candidate it has ever been the misfortune of this country to see. A year when I moved house, retired, and began to build a new career as an artist. The contrast makes my head swim. No great revelations occurred to me at midnight on this first day, not even a quiet epiphany. But there was the sense that a line had been crossed, if only because we had survived a difficult year mostly intact. The Zen saying goes: Before enlightenment: chop wood, carry water. After enlightenment: chop wood, carry water. Yesterday I wrote morning pages, cleaned cat boxes, and worked in the studio. Today I shall write morning pages, clean cat boxes, and work in the studio. I will post to my blog about the cuffs that I finished this week. There will be the little rituals of beginning a new year - eating herring, taking down old calendars and putting up new ones, doing a little of everything that one wants to do in the new year. There will not be the making of resolutions. I have my hands full trying to keep the ones I've already made. There will be the continuation of daily life which is, after all, what we wish for when we celebrate the new year. We wish that the sun will continue to come up, that we will have enough to eat, that we will have shelter, and that we may hope for improvement. Chop wood, carry water. Maybe a better axe, possibly a better bucket, but chop wood, carry water. If we do not chop and carry then we are done. No more scent of new cut wood, no heft of split logs tugging arms down. No texture of the ground below while walking to the woodpile. No sound of water splashing into the bucket. No crisp cool taste of well or stream. Chop wood, carry water. Live life in all its sensory detail. Even the smallest, most pedestrian things can have savor if we pay attention to them. Having carried water thirst will be quenched. Having chopped wood fire will fire warm us. Having done both we may have soup. And there yet may be warm weather and soft breezes and birdsong in days to come. Chop wood, carry water, take care of your needs. Pay attention to the world and be nourished. And more - make art. Daily. Nourish your soul and celebrate the world. Chop wood, carry water, make art. Hear the axe thud and the wood crack apart. Watch the glint and play of water splashing into the bucket. Savor the warmth of the fire, the tension in muscle, the flavor of food, the relaxation of sleep. Turn it all into music, dance, clothes, jewelry, pottery, paintings. Chop wood, carry water, make art. May your year be full of days, may your days be full, my friends. Lots of little things got done this week. New vise jaw liners for the smaller vise on my raising stump. That vise got remounted so it doesn't wobble any more. I mixed up a batch of Edinburgh etch solution in preparation for some experiments. Several boxes of miscellaneous stuff got unpacked and put away properly. And I finished two more cuffs. 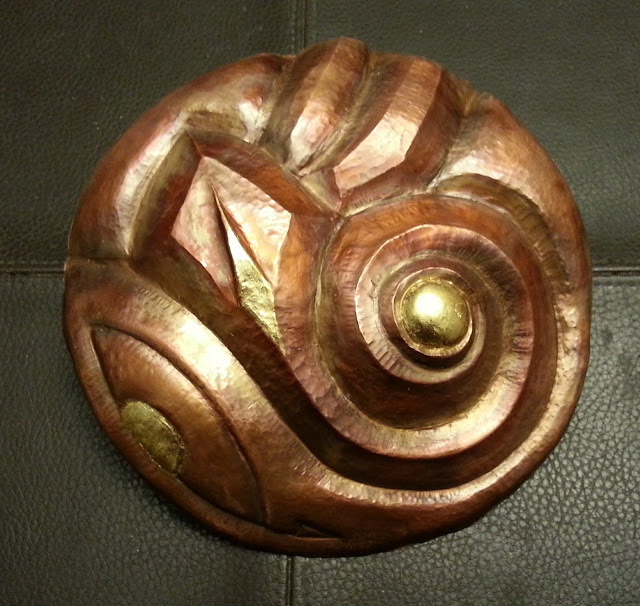 Left is brass, right is copper. Both cuffs are fold formed and air chased. 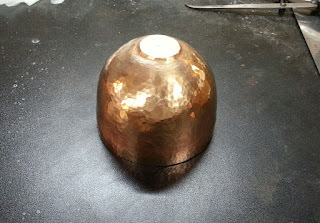 The left one is brass, no patina, tumble polished and sealed with spray lacquer. The right is copper, liver of sulfur patina and brass brush plating on the center forms. Also spray lacquer sealed. All contents copyright Lew Shieber . Theme images by billnoll. Powered by Blogger.